AS an African American in Namibia, one thing that has continually frustrated me is how much of its tourism industry is controlled by its white descendants of colonialism. White voices also dominate most international travel guides on touring Namibia. Consequently, there are many people who have visited Namibia but haven’t really experienced Namibia. Mainstream tourism advice does little justice to the vast array of phenomenal cultural experiences one can have here. To truly see Namibia is to venture off the beaten path and allow black Namibians to be your guide. Here are eight ways to visit Namibia while supporting black business and experiencing all the rich culture this southern African nation has to offer. A traditional Owambo tribe hut in a northern Namibian village of the Omusati region. A visit to Namibia is not complete without a trip to the northern regions of the country. Many guidebooks will make it seem as if outside of natural attractions, there is little to see here. Do you want to really experience the northern culture and tradition that the majority of Namibians come from? Then you'll have to delve a bit deeper than waterfalls and game drives. Spark a conversation with a trustworthy individual. If you network the right way perhaps someone will arrange a visit to their home village for you. Or stroll through one of the north's larger towns like Outapi or Katima Mulilo and submerse yourself into the blends of heritage and urbanization. My husband and father tasting out meet at a Namibian open market. You haven’t lived until you’ve tasted Namibian beef, also known as Kapana. For this delight, take a trip to the renowned Single Quarters. It's an outdoor market that sits in the Katutura location about 15 minutes outside of the capital’s city center. A heavy plume of smoke will greet you as you enter this open market. Men standing in a line of grills will invite you to sample their cooked beef. You can devour it right off the grill or from within a piece of newspaper. You'll likely catch a glimpse of a few cow carcasses lying around. This is a visual guarantee that you’re getting some of the freshest meat you’ve ever had. Be sure to dip your beef into some ‘spice’ (seasoning). Then purchase a few fat cakes (fried dough) from the women selling behind the grills to compliment your Kapana! There are also open markets in several other Namibian towns, such as Rundu, Oshakati and more. One way to support black business is to stay at a hotel owned and operated by Namibia Wildlife Resorts (NWR) - a state-owned company. You can watch my recent stay at the NWR owned Popa Falls Resort here. Supporting these resorts is particularly important as a sizeable portion of the country's tourist accommodations are owned by whites. I can also recommend Ekamuti Town Lodge, a black-owned accommodation in the northern Namibian town of Ondangwa. Or consider sleeping at a smaller guesthouse. These are often someone's home turned into a rental accommodation and advertised in local newspapers. 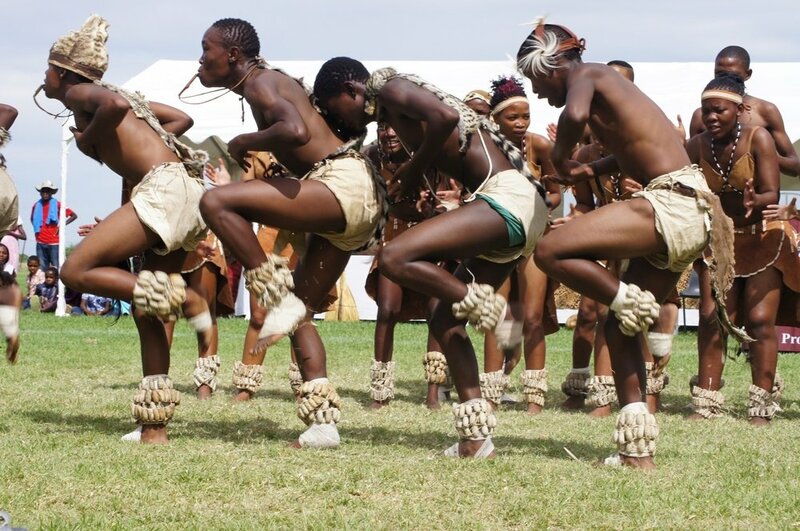 The Tswana Cultural Group performing at a national cultural festival in Grootfontein, Namibia. Want a seat at some of the local festivities? Then plan your visit to Namibia around a public holiday like Independence Day (March 21st) or Heroes Day (August 26th). These holidays include various cultural and historical celebrations and commemorations around the country. They’re also some of the best opportunities to experience Namibia's national pride, hear government leaders speak, and learn about the country’s progress and goals for the future. A local vendor selling craftwork in Swakopmund, Namibia. During a visit to any Namibian town, you will probably notice people selling items on the street. Women primarily sell fruits, vegetables, and candy. Men typically sell items like cell phone and internet airtime and newspapers. This is the essence of small business in Namibia and how much of the lower income Namibian population makes a living. I recently decided to at least buy my fruits and veggies and the occasional ‘sweet’ from these informal traders. Why not support them instead of the giant supermarket conglomerates that are often headquartered in South Africa? You can also opt to buy local arts and crafts from street merchants rather than large retailers. 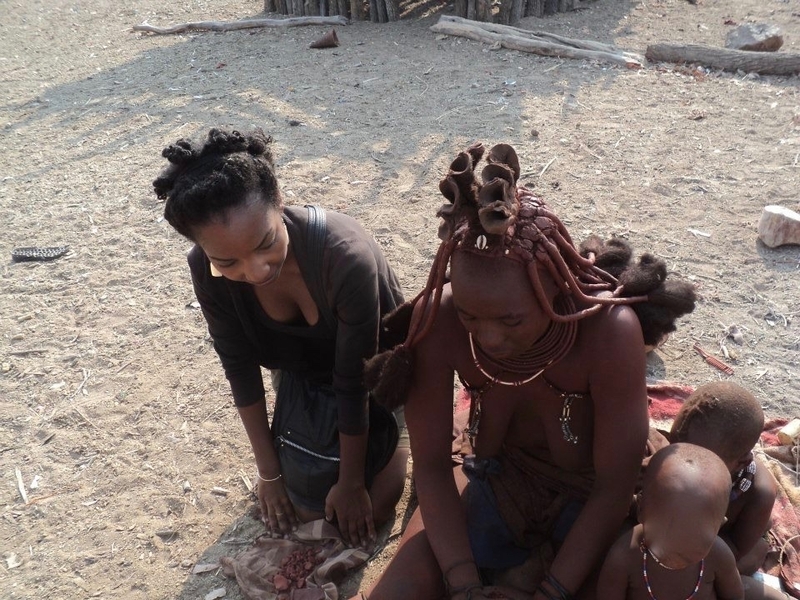 The author learning traditional paste making from a Himba woman. For a peek inside the lives of Namibia’s renowned Himba tribe, consider a visit to the northern town of Opuwo. There is a Himba woman who goes by the name, Queen Elizabeth, who arranges tours to local Himba villages. You can ask around or find her in town. As your tour wraps up, you will find yourself surrounded by a circle of Himba women selling their handmade craftwork. These are unique pieces that will be hard to find elsewhere. In fact, there are several Black-owned tour companies across Namibia such as Hafeni Tours, among others. A traditional double-edged knife my husband had made and engraved for our son before his birth. For a truly authentic experience with Namibia’s hunter-gatherer San tribe, visit the Little Hunter’s Museum. Just outside the eastern town of Tsumkwe, this living museum will immerse you into San culture. You can go on a San hunting trip and learn how to make their traditional bows and arrows. Lessons are also offered in how to make tribal jewelry. Or top off your visit with a cultural performance. These excursions serve as a source of income for local San community members, who are one of Namibia’s most marginalized populations. Visit Otjikaendu Den for the famed 'smiley' (goat head), pictured here. I often notice tourists dining out at larger scale establishments. If only they knew how much they were missing out on. Why not dip deeper into the Black Namibian social scene? You can fill your stomach and your conscience at one of the many black-owned eating establishments. Don't hesitate to chat with locals for their recommendations. Have a 'smiley' (goat head) at Otjikaendu Den, a restaurant in Windhoek’s Luxury Hill community. I can personally attest to all the deliciousness and overall friendly vibe of Otjikaendu. For an authentic Oshiwambo tribe cultural meal try Xwama Cultural Village, also in the capital. Want a quick order of chips (french fries) and a cool drink? There are small shops and shebeens (bars) all across the country to satisfy your cravings. In Namibia's capital, you can have food delivered to your doorstep by the Black-owned, Windhoek Fast Food and General Delivery Services. In essence, Namibia is an incredible nation with almost too much to experience in one visit. Adorn your visit by supporting Black business and experience the fullness that the land of the brave has to offer. What recommendations or advice can you share for supporting Black business while visiting an African nation? Share your tips in the comments below! Or, start researching flights and accommodation just below!